• $1 off food menu; $4 wells, $4 drafts, $1 off wine. Plus daily happy hour special. Wednesday happy hour all day. A locals' favorite with a cozy reclaimed wood interior, a full bar, and its flagship food cart outside the front door to keep you well-fed. People come from all over to feast on the chicken sandwich, perhaps you should give it a try. With rotating taps of Central Oregon beers (and kombucha) and hand-crafted cocktails featuring muddled fruits and veggies, what's not to love? 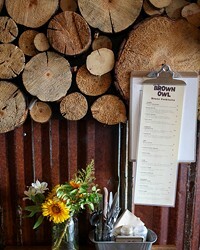 The Brown Owl's original food cart sandwiches were so crave-worthy that eventually the owners simply had to open their own brick-and-mortar. Check out the buttermilk fried chicken on its own or the 7-hour bourbon-braised brisket and you'll be in heaven.